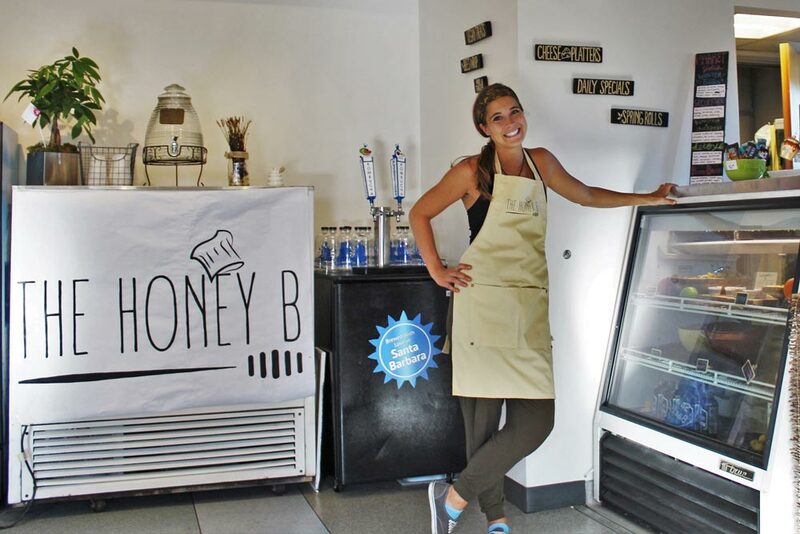 Now open atop Antioch University in Santa Barbara is The Honey B, a waffle sandwich and “Buddha Bowl” rooftop café at 602 Anacapa St. Most of The Honey B’s menu is either vegetarian or vegan, and revolves around healthy, locally-sourced ingredients. The restaurant is the creation of Katie Belanger, whose chocolate-raspberry cake won a 2014 episode of the reality TV show On the Menu after she moved to California from the Midwest. Belanger turned her cash prize from the show into Cinnies, a vegan wholesale baking company, and started catering events and opening pop-up restaurants. Belanger acquired the Antioch location after finding two business mentors at the university. Many of her fruit and vegetables come from local growers. “Any little product that I see at the farmers’ market, I’ll try to think of a recipe that I could incorporate into the café,” she said. Though it’s on the roof of a private college, The Honey B, which opened Oct. 7, is open to the public, and has Wi-Fi, an outdoor patio and a fire pit. “I call it a little hidden gem that shouldn’t be so hidden,” Belanger said. The Honey B also does catering, she added, and is open 8:30 a.m. to 6:30 p.m. Monday through Thursday, 8:30 a.m. to 2:30 p.m. Friday and Saturday, and is closed on Sunday.